The Creative Direction staff has developed many unique companies, systems, products and services the most recent of which is a white label or private brand web site media platform with robust features designed to help businesses and organizations take advantage of the revolution in social network marketing. There currently appears to be a window open for those who would like to invest in innovative technology ideas, products, services, and the companies that develop them. Today, billions of dollars in fresh venture capital is being invested in new tech companies and IPOs. Pandora and LinkedIn have recently gone public with multi-million dollar valuations - even without the profits to justify it by traditional standards. LinkedIn is trading at 750 times its estimated 2012 projected earnings. Seven year old Facebook is expected to go public early next year and its valuation has passed the $80 billion mark. And Skype, purchased from eBay in September 2009 for $2.75 billion, was sold to Microsoft in May 2011 for $8.5 billion. What we are proposing is an opportunity to invest in a company with immediate market-applicable ideas, experienced management, a relatively small investment, a fast track growth plan and very attractive potential for an M&A at any part of the growth stage." Participating in a start-up with a product that is ready to go to market. A key management team in place with the experience and knowledge needed to make the business a success. An award-winning in-house marketing capability - a key factor. A history of successes by staff members in developing a number of unique companies, systems, products and services. Social Networks That Do is a white label or private brand web site media platform with robust features designed to help businesses or organizations take advantage of the revolution in social network marketing. It helps businesses grow by providing a value-priced and easy-to-manage way to build a branded social network around their own company's products, services, events, activities and attributes. It is the latest and best way to target, attract, develop, and retain prospects and customers who contribute, collaborate, and share in similar interests. The social network phenomenon has spawned a new style of communication that has caused a substantial change in the way products and services are marketed or promoted today. As of March 31, 2011, social network members total 1 billion on an internet serving over 2 billion users. Facebook, as an example, now has 750,000,000 members and Twitter sends out over 1 billion tweets every day. 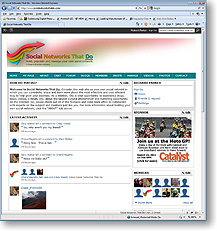 The Social Networks That Do new web site was developed to showcase a unique approach to social network marketing and allows those interested to contribute and share content in order to try out blogs, forums, videos, news, and many other features. For more information or a presentation e-mail info@creativedirection.com. © 2015 Creative Direction, Inc. All rights reserved.